Refactor is a physics based platformer taking elements from classic Metroidvanias. Placed in a world that is a puzzle itself, you can literally turn the world upside down by rearranging the map and building your own pathways through the game. Uncover secrets, acquire new abilities and upgrades, and discover where you fit in the world. Refactor blends classic metroidvania elements with the falling block puzzle genre to create an entirely unique physics-based puzzle platforming experience. Set in a world that is a puzzle itself, the rooms that make up the map can be reordered, moved around and even rotated, all in real time. 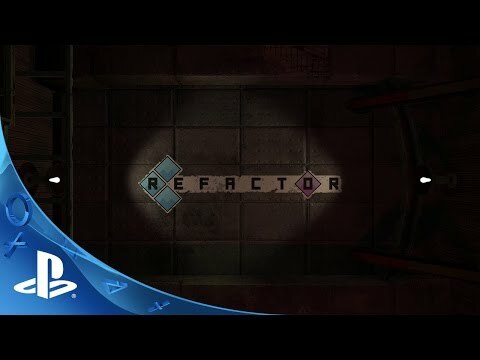 Construct new pathways to previously inaccessible areas, solve mind-bending puzzles and uncover the secrets of Refactor. Every day in the world of Refactor, thousands of puzzle pieces are created for the explicit purpose of playing “The Game”. Requiring perfection, only perfect puzzle pieces are selected for use and those who are imperfect are shunned by society and decommissioned. Two misshapen characters escape their fate and team up to create a completed tetromino. It is up to the pair to defeat the gatekeepers, acquire new abilities, and discover where they fit in. In Refactor each of the four-block tetromino shapes is tied to an ability that changes the way the player traverses and interacts with the world. These shapes can be further augmented by special abilities and upgrades allowing for gameplay customization. Reaching control points grants the ability to rearrange the map forming new pathways. As the map is changed, enemies and boxes shift and fall, doors swing open or closed, and platforms become accessible. Each zone of Refactor has a new, unique element that adds a layer of complexity to the gameplay.